On this day in 1947, Lady Hilton Young (Kathleen, Lady Scott), died in London. 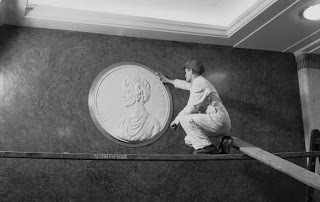 A scultpor of portrait busts and figures, she created the plaque of Her Majesty Queen Mary, which was hung at the head of the main cabin class (1st class) staircase of the RMS Queen Mary. Lady Young studied in Paris under Auguste Rodin before marrying Captain Scott of the Antarctic and then later, Sir Edward Hilton Young (later Baron Kennet of the Dene). She also authored her autobiography, Self-Portrait of an Artist, which was published posthumously in 1949.